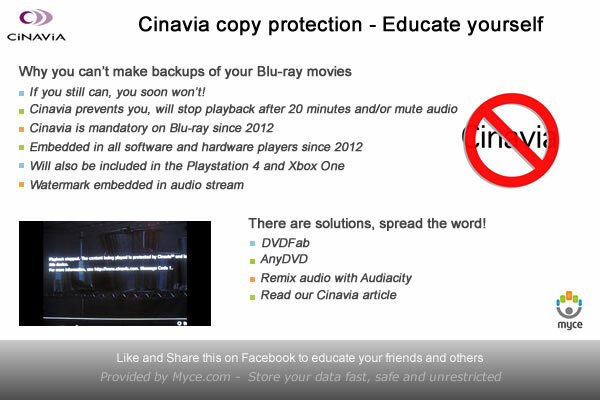 Cinavia is a copy protection that has been introduced to all recent Blu-ray players and Cinavia prevents you from playing personal backups. In this article we discuss what Cinavia does, how it works, and what you can do to bypass it. This article was last updated: 20th of August 2018. Note: We do not condone piracy. This article is targeted to users in countries where it’s legal to make personal backups of discs. Cinavia is a copy protection developed by a company called Verance and has been mandatory on all new Blu-ray players since 2012. The protection was designed to protect content owners against piracy. It’s designed to prevent the release of movies recorded in movies theatres (CAM releases) on the Internet or for personal use but also to prevent copying discs for private use. In order for the protection to work an audio watermark needs to be imprinted and the software or hardware to playback the content needs to contain a Cinavia detector. This Cinavia detector is being introduced on more and more Blu-ray players. The protection has been a mandatory part of the Advanced Access Content System (AACS) on all Blu-ray players since 2012 and a Cinavia detector can now be found in software players from e.g. Cyberlink, Arcsoft, Nero but also in recent hardware Blu-ray players from all manufacturers, as well the Playstation 3. Old Blu-ray players usually do not contain a Cinavia detector and accept copies of Cinavia protected discs. Cinavia interferes with you from making personal copies of movies. If you want to keep your original safe from e.g. your children and want to make a copy to use daily, then the protection will stop you. If you have older Blu-ray equipment you might not have dealt with Cinavia yet, but new consoles with Blu-ray playback capabilities like the Playstation 4 and Xbox One will contain a Cinavia detector for sure. The protection will also interrupt playback of downloaded movies (e.g. from torrent sites). While the movie appears to play, it can mute the audio or stop playback after a certain amount of time. The protection works by embedding an audio watermark in the audio streams of the movie and is applied on several locations of the audio stream. This watermark is preserved and transferred when you record a movie or audio track. A Cinavia detector checks to see if the watermarks are present and match certain preconditions. The Cinavia detector detects playback of a movie recorded in or intended for movie theaters on a home device. It can also check for playback of a disc on which the AACS key is not equal to the key used to encrypt the original. While the protection might seem simple to hack, it’s not. The developers have incorporated technology that will survive fiddling around with the audio including format shifting, adding additional distortion, increasing pitch, and changing frequencies. Their goal is that altering the audio in such a way that the watermark can’t be detected anymore should result in audio degradation that would destroy the quality compared to the original audio. of the developers is also to let attackers think they succeeded to hack the protection to find out later that it did not work. The Cinavia patent shows that the locations of the watermark will differ from disk to disk. This means that if the protection is cracked for one disc it doesn’t mean the protection can removed from all disks. Even if you know where the watermark resides on that one disc. While Cinavia is embedded in the audio and therefore the original audio is modified, the developers of the protection claim that it doesn’t degrade the audio quality. They support that fact by stating that movies on which Cinavia has been employed have received Oscar awards in the “Best Sound Mixing” and “Best Sound Editing” categories. The developers don’t claim that the watermark protection can’t be hacked, but they are confident that they will be able to continue to improve and update their protection to stop the majority of piracy and make it even harder to crack. Cinavia Notice: This product uses Cinavia technology to limit the use of unauthorized copies of some commercially-produced film and videos and their soundtracks. When a prohibited use of an unauthorized copy is detected, a message will be displayed and playback or copying will be interrupted. Copying stopped (video) – Shown when you try to record a movie from a public place Audio muted – This message usually appears after a certain amount of time (usually 20 minutes) and you will no longer hear any sound. It will be shown when playback a movie from a disc, usually a homemade copy. Copying stopped (audio) – This appears when you try to record audio from a Cinavia protected movie and the recorder contains a Cinavia detector. The largest annoyance among users seems to be the muted audio that appears when you playback a backup of a disc you own. This is especially annoying since the protection shows the message and mutes the audio when you’re just into the movie. It’s important to note that discs unprotected with Cinavia do play on players that are Cinavia enabled. Only if the watermark is found on an invalid source will the playback will be disrupted. Discs protected by Cinavia will also play on players that do not contain a Cinavia detector. Movies illegally downloaded from the Internet can contain Cinavia watermarks and might stop playing or mute the audio after a certain amount of time and show you a message like mentioned before. While the Blu-ray player detects that you are trying to playback an unauthorized copy, the developers of Cinavia stress that the protection does not send your data to anyone. Cinavia latest release, Level 3 will show the regular message but also includes a link that informs you how to obtain a legal copy of the content (E.g. to a paid download website). As explained above when the Cinavia detection routines are triggered a variety of messages and responses can be generated. The reasons for this seem to constantly cause confusion however the rules determining which response occurs, and under which circumstances, are governed by the Cinavia ‘Windowing Model’ which was leaked to the public domain some time ago. 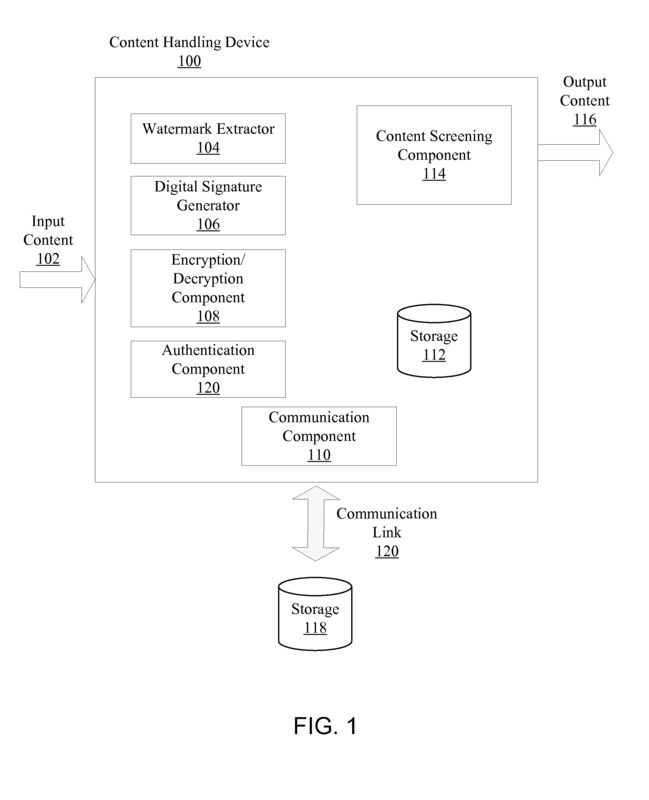 The degree to which content needs to protected differs during the lifecycle of a particular title. For example when a movie is only available in cinemas it’s necessary to block all other content sources. After this initial period though official Blu-rays need to be able to be played and this restriction can be relaxed. 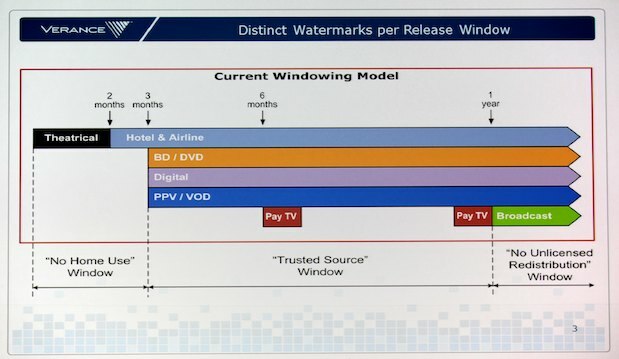 These stages during a product’s lifespan are known as ‘release windows’ and Cinavia divides this product lifespan into three different release windows. When the Cinavia detection routines are triggered the response is different during each of these release windows for each type of playback (as represented by the coloured bars in the graphic below). When an appropriate watermark is detected during the ‘No Home Use Window’ ‘Cinavia Message Code 1’ is triggered and playback ceases. Typical on-screen message:“Playback stopped. The content being played is protected by Cinavia™ and is not authorized for playback on this device. The audio track of the video that you are playing contains a Cinavia code indicating it was intended for presentation using professional equipment only (for example, in a theater) and is not authorized for playback by consumers. When an appropriate watermark is detected during the ‘Trusted Source Window’ ‘Cinavia Message Code 3’ is triggered after 20 minutes of playback time. The audio track of the video that you are playing contains a Cinavia code indicating that it is an unauthorized copy of professionally-produced content. Note that Message Code 3 is only triggered after 20 minutes and according to Verance this is for production reasons as it ensures that quality control checks can be carried out on unfinalised, unencrypted discs without triggering the protection. Message Codes 2 and 4 are only triggered when attempting to copy Cinavia protected material on Cinavia compliant devices (such as Blu-ray recorders). While Cinavia is annoying and not an easy nut to crack, there are ways to make backups of your precious movies and remove Cinavia in such a way that the copy will play as intended. Here a list of Cinavia removal method that you can try, they are tested and work. The easiest way is to purchase software that will help you deal with the Cinavia removal process. They often need to be updated in order to deal with newer movies and besides the initial investment that’s usually the only drawback. Visit our forum for the latest developments on Cinavia (removal) technology. Are there any questions left? Then subscribe (with a Google/Facebook/Twitter account it takes less than a minute) and ask your question. There are always experts around to answer your question! The following change of setting seems to work for several users, sometimes for long, sometimes temporarily. Go to settings -> Date and Time settings -> Set manually Change the year e.g. from 2013 to 2014. Done! DVDFab is able to copy a whole lot of movies that are protected by Cinavia. The company has a page on its website on Cinavia where it explains how DVDFab can help you with Cinavia removal. The company offers a 30-day trial, so you can try out how it works without any risk! Slysoft has added support for removing Cinavia from Blu-ray movies since April 2015. Previously the company only tricked the Cinavia detection routing of a select few software Blu-ray players. Because the new version actually removes the Cinavia signal from the audio track when used with CloneBD, the copy will work on all Blu-ray players, both hardware and software based. DVD-Ranger has released their CinEx HD module. For a long time this software was the only application that made it possible to end up with a Cinavia free copy of your movie. You can use this software to make copies of your movies that playback on any device and any Blu-ray playback software but need to download a database that’s specific to the movie first. Another possibility is remixing and changing the audio from your movie. As we’ve mentioned before, the protection is developed in such a way that it will continue to work if you modify the audio, but there are some claims that it’s possible. The audio quality is degraded, but with the right settings and tweaking it might be an interesting way of removing the protection. With Cinavia versions from 2012 and onwards this is hardly an solution, as the audio has to be degraded significantly to remove the Cinavia watermark. The audio will be so bad that it’s hardly watchable anymore. Most modern Blu-ray hardware contain a Cinavia detector. By using patched firmware it’s possible to disable the detector. This doesn’t remove Cinavia, so the discs will only work on the player with the modified firmware. Unfortunately only possible on a limited number of (OPPO) devices. We hope this article has given you more insights in the Cinavia protection. Not everyone might be aware of it, we ask you to please share the image below on social media and point them to this article. We’d love your comments, also with additional information, tricks and tips. Extra credits: This article has been co-authored with Wombler who was kind enough to fix errors and provided additional information, thank you! Questions, or want to talk further about this? Discuss this in our Movie Copy Forum.